“Gardening becomes increasingly difficult as we age, yet the garden beckons as strongly as ever,” notes Butte County Master Gardener Kay Perkins. Our bodies become less limber and agile, and more prone to injury, which makes tasks such as pulling weeds, pushing wheel-barrows, digging holes, pruning, hauling, and moving heavy objects ever more challenging with advancing years. But the idea of voluntarily giving up the passion and pleasure of working in the garden is unthinkable for most gardeners. With that in mind, the UC Master Gardeners of Butte County recently held a workshop on how to stay healthy and active in the garden, offering practical advice that can help transform daunting chores into sustainable activities. Workshop leaders Kay Perkins and Marsha Ebert shared information about landscape strategies, plant choices, labor-saving techniques, and cleverly-designed tools. The workshop topics were summarized from a book by Sydney Eddison, Gardening for a Lifetime: How to Garden Wiser as You Grow Older. Eddison is the author of six previous books on gardening, and was awarded the National Garden Clubs, Inc.'s Award of Excellence in 2010. For over 50 years, Eddison (who was born in 1932) was an aficionado of time-consuming gardening choices: "It took a great deal of effort to make my garden as high-maintenance as it is….That was the point of it all” she writes. Then a bothersome hip replacement put a damper on her garden activities, one of which was "digging great big holes and moving plants around all the time.” Refusing to give up the gardening she loved, she began researching low-maintenance garden techniques. Those discussed at the workshop are explained below. A list of suggested tools and plants can be found at the end of this article. Rethinking Perennial Borders: Eddison once designed, planted, and maintained huge perennial borders. Perennials are notoriously labor intensive, often demanding year-round attention, including staking, deadheading, pruning, dividing, and neatening and tidying. 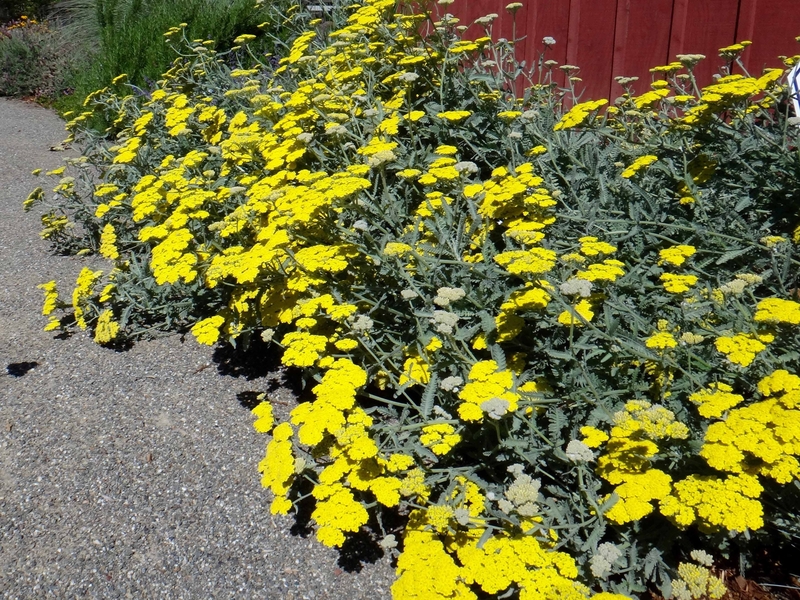 Granted, they offer enormous rewards in terms of color and texture, and add overall interest to the landscape. Eddison argues that shrubs can play the same role in the garden, with infinitely less trouble. Shrubs offer the same or more value, for less work. Choose compact or dwarf varieties of popular shrubs (such as buddleia) that need pruning only one or two times a year. Shrubs that produce berries add a splash of bright color to gray winter days, and provide a source of food to overwintering and migrating bird species. Eddison is a fan of conifers because they offer year-round color and variegated foliage texture, and also add structural interest in the form of cones, globes, and mounds. But choose wisely and think carefully before planting shrubs as they are more difficult to move than perennials. 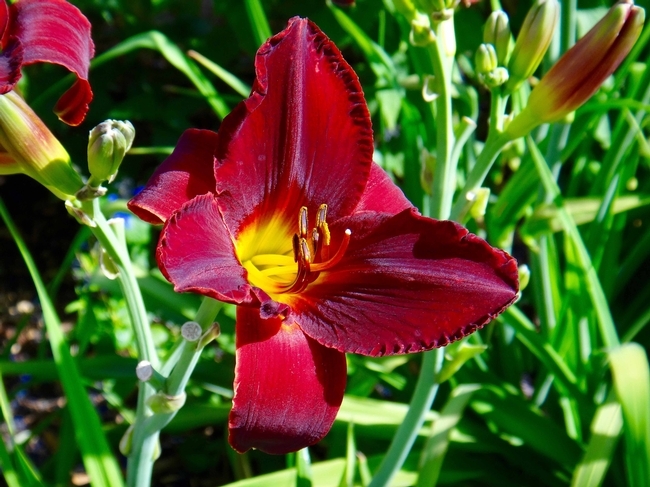 Perennials that do make the cut for a lower-maintenance garden border should be held to a high standard of good behavior. They should be able to retain attractive form and color throughout most of the seasons, particularly our hot, dry summers. 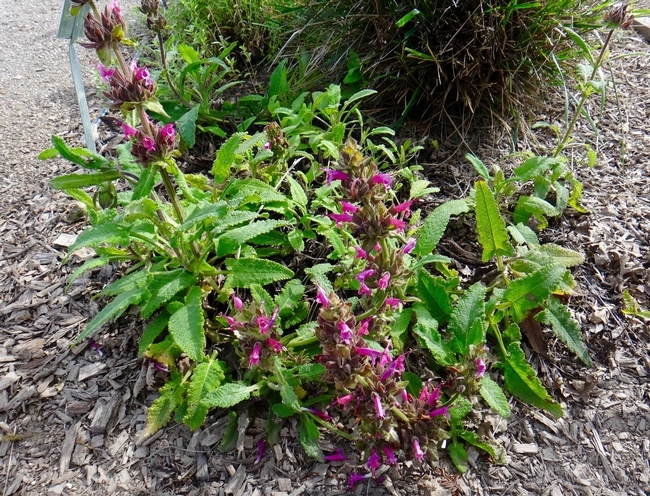 Well-behaved perennials must maintain a tidy habit, with no flopping or sprawling. If any plant, be it shrub or perennial, tends to dominate your time, you can reduce the number of them you allow in the garden, or find a replacement. List, list, list: Making lists saves time, reduces aggravation, and increases organization and efficiency. Take the time to develop a Master List and a Daily List. The Master List should contain all garden tasks, large or small, organized by season and species (such as tree, shrub, or perennial), prioritized by importance. Your list may seem daunting and impossibly long at first, but Eddison promises that you will be surprised by how many of these tasks you will be able to accomplish. Nothing beats the satisfaction of crossing a task off the list for that season. The Daily List is developed from the Master List and should be realistic for the time you can allot to the garden on any given day, and for your abilities. This list should also indicate if the task is essential or aesthetic in nature. These lists can help you keep from getting distracted or pulled in different directions by the garden's demands. If you are lucky enough to have a helper in for the day, a list for your helper will save him or her time. Hire Helpers: The wisdom of age tells you that those days of “I can do it all without help” are over. Start by determining what kind of help you need (and this will change over time). Do you need help periodically with large jobs, on a weekly, monthly, or seasonal schedule, or would you like to be able to call on someone as needed? Do you need an experienced professional, or someone to whom you can teach the necessary skills? Places to find garden helpers include: horticultural programs at high schools, vocational schools, and community colleges; referrals from fellow gardeners; and contacts from local nurseries. Be sure to be clear about what you want your helper to do. And make sure you are realistic in your expectations, the number of hours you think tasks will take, and what you are willing to pay. Speaking of Being Realistic: Gardens are only perfect in catalogs and (perhaps) for a short and finite window of time in our own yards. Learn to accept imperfections, and understand that plants are always in a state of “becoming.” Leave some dead leaves under shrubs to serve as mulch that will enrich your soil. Allow grass clippings to remain on the lawn, to sink in and feed the grass. By the way, whatever it is, if it's kept short and green – viola! - it's a lawn. Realize which plants have grown beyond your ability to manage. Decide whether to 1) continue to invest time and money into them; 2) give them a brutal pruning to see if that revives them; or 3) remove and replace them. The hardest friends to remove are the old landscape trees which have contributed shade and beauty to the garden over many years. If one must go, don't be too quick to replace it – you may find the increased sun allows new landscape opportunities and that you enjoy the newly-opened space. Container Gardens: Gardening in attractive containers of varying shapes and sizes is an excellent choice for yards with poor soil, and for those gardeners with increasingly limited mobility and/or strength. Containers placed along paths or around decks create a sense of structure and privacy, while providing displays of life and color. Ergonomic Tools and Tool Suppliers: Loppers and pruners with soft grips; ratchet loppers and pruners; pole saws with extension handles; lightweight durable ultra-flexible kink-free garden hoses such as those made by Zero-G; digging and weeding tools such as those made by Radius Garden tools; hori hori knives; short- and long-handled weeders; shovels with U-handles; kneeling pads and benches; rolling seats; aprons with deep pockets. Battery-Operated Tools: Blowers, hedge trimmers, lawn mowers, weed whackers, hand spreaders. Other Tips: Use lightweight containers or rolling carts for hauling; plant in raised beds; use a pool siphon for cleaning ponds and water features; keep a cell phone or whistle with you when gardening; take frequent breaks to stand and stretch; stay hydrated. Shrubs: Callistemon (bottlebrush); Cercis (redbud); Chaenomeles (flowering quince); Cistus (rock rose); Cotinus (smoke tree or smoke bush); Dodonaea (hop bush); Grevillea; Echium; Lavandula (bush lavender); Osmanthus (sweet olive); Prostanthera (mint bush). Perennials: Achillea (yarrow); Anigozanthos (Kangaroo Paw); Caryopteris (Bluebeard); Epilobium (California fuchsia); Hemerocallis (day lily); Iris (see below); Origanum (oregano); Nepeta (cat mint); Perovskia (Russian sage); Salvias; Solidago (golden rod); Teucrium (Germander); Westringia (Coast rosemary); grasses such as Bouteloua, Carex, Muhlenbergia, and Stipa. Sedum 'Autumn Joy', Agastache “Blue Fortune”, ornamental grasses, Liriope, Boltonia asteroides “snowbank”, Amsonia, Aster 'Raydon's Favorite', lamb's ears, Siberian iris, and daylilies. Sydney Eddison, Gardening for a Lifetime: How to Garden Wiser as You Grow Older (Timber Press, Timber Press). But underneath that homely exterior lies a true gem. This tree's many common names testify to its importance: gray pine, California foothill pine, foothill pine, nut pine, bull pine, and ghost pine. Its pejorative historic name, digger pine, is no longer in use. The Maidu named it “towáni” and the Yana called it “c'ala'I.” Its scientific name derives from the English lawyer, naturalist, and writer on horticulture Joseph Sabine (1770 to 1837). Sabine had a lifelong interest in natural history and was an original fellow of the Linnean Society. It was Sabine who was responsible for sending David Douglas on specimen collecting trips, specifically to supply plants to the Royal Horticultural Society Gardens. Like the blue oak, a common co-habitant, the gray pine is endemic to the California Sierra Nevada and Coast Range foothills. The two trees are so often found together that "oak/foothill pine vegetation" or "oak/gray pine vegetation" describes a type of habitat characteristic of the chaparral and woodlands ecoregion in California. Gray pines even surpass blue oaks in their ability to tolerate harsh conditions: they are found in the Transverse and Peninsular Ranges, and the Mojave Desert sky islands. They can handle from as little as 10 inches of rain per year to an annual 70 inches in parts of the Sierra Nevada. While these pines prefer rocky, well-drained soil, they will grow in notoriously poor serpentine soils and heavy, poorly drained clay soils. Their ability to withstand extreme soils comes from a special adaptive strategy: they are able to regulate uptake of soil nutrients as needed. 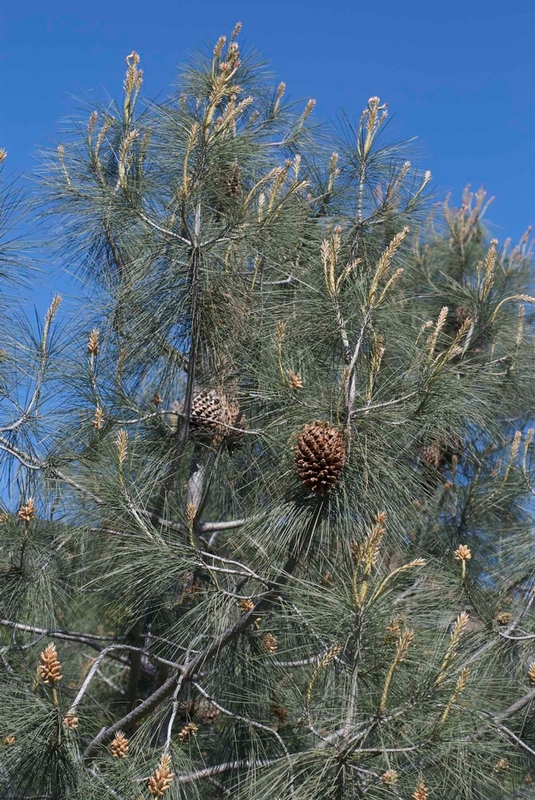 For California's native peoples, the gray pine was (and still is) a nutritional jackpot! Pine nuts are densely caloric, loaded with protein, easy to harvest, and store well for long periods. While many of California's pines provided food to native populations, the nuts of the gray pine were the most highly valued. They could be eaten raw, parched in baskets, and steamed in earth ovens. They were pounded into flour that was made into butter, soup, or bread; mixed with meal made from other dried seeds; and combined with dried salmon. In spring, green cones were roasted to yield a syrupy treat. Every part of the pine tree had a use. Deadfall was used for firewood; needles served as tinder or were fashioned into torches and were also burned as a smudge for spider bites. Fresh, frangrant needles were spread on the floor of earth lodges. Supple branches were used as stirring sticks and to lift hot rocks from fires. Pine roots were used in basketry and the pine's abundant resin was used for medicinal purposes. Traditionally this species provided vital resources to native peoples. One can only imagine how horrifying it must have been for the tribes that relied so heavily on this tree, to see most of the old growth pines “harvested” during the Gold Rush era to fuel the engines at quartz mines. Crooked, ragged, and awkward as the gray pine may appear, its ability to thrive under environmental hardship, and its value to native peoples' survival make it an ecological and cultural champion. After all, handsome is as handsome does. M. Kat Anderson, Tending the Wild: Native American Knowledge and the Management of California's Natural Resources (University of California Press, 2005). It didn't take long. Soon after the first post-Camp Fire rains, there was green in the burned area. Along lower Skyway, a blanket of soft verdure overlay the harsh scars of incineration. 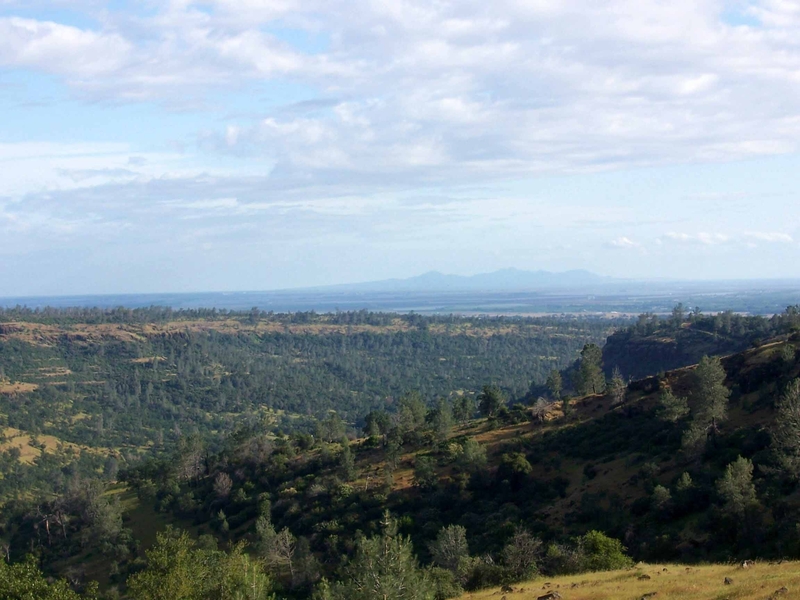 While the people of Paradise rebuild and replant in the developed areas, what will grow back in the foothill grasslands and the forested areas? 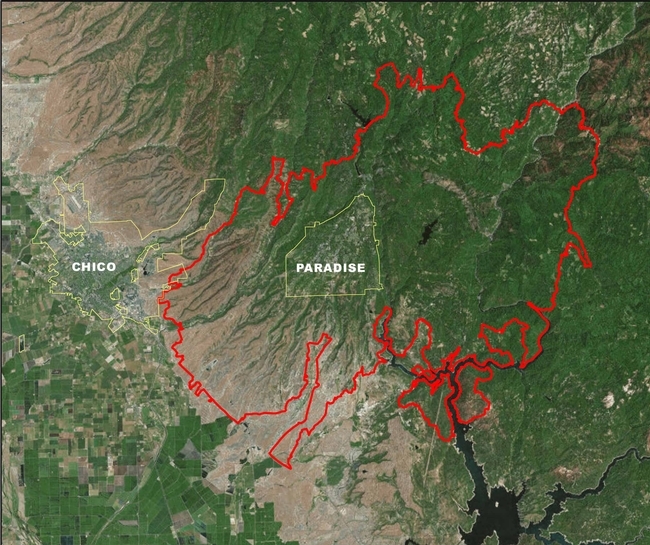 The bulk of the approximately 240,000 acres that burned comprises a gentle rise at the western border, graduating upslope into a “system of volcanic ledges bisected by a fan of deep ravines emptying into the Sacramento Valley” (“Sierra Town had Prepared for Much Tamer Wildfires,” Los Angeles Times, December 30, 2018). Much of the area sits in the foothill oak woodland and chaparral zone of the western Sierra Nevada. Botanically, this ecosystem is defined by grasslands (non-native and mixed grasses), and woodland savanna (primarily blue oak, gray pine, and chaparral). Chaparral species include buckeye and several species of manzanita and ceanothus; varieties of oak that grow in this zone are scrub oak, coast live oak, canyon live oak, and interior live oak. Farther up the shoulder of the Sierra Nevada, starting at about 3,000 feet, the ecosystem shifts to the lower montane forest zone. Tree species thriving in this zone are a diverse mix of ponderosa pine, California black oak, sugar pine, incense cedar, and white fir. Plant recolonization after a fire or other major disturbance is known as secondary succession. In general, and broadly speaking, first the “pioneer species” appear, and the landscape is dominated by small flowering herbaceous plants which die back with the summer dry period. So the usual suspects that bloom each spring and early summer in our area, like lupine, poppy, and monkeyflower, should be back. 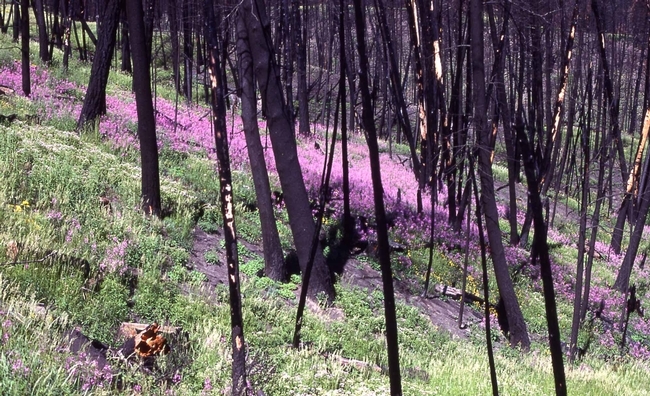 We may also see the spectacular fireweed (Chamerion angustifolium, also classified as Epilobium angustifolium), often one of the first colonizers of the soil following a fire. After the 2016 Lake County fires, fireweed's beautiful magenta blooms dotted the hillsides along State Route 20. Annual grasses, both non-native and mixed, usually occur concurrently with flowering herbaceous plants in the same successional stage; forbs (non-woody plants which are not grasses) typically succeed the flowering herbaceous species. According to the University of California Cooperative Extension (UCCE) Annual Rangeland Handbook, annual grasses in our area are soft chess, ripgut brome, wild oats, red brome, wild barley, and foxtail fescue. Broadleaf filaree, redstem filaree, turkey mullein, true clovers, bur clover, and popcorn flower are among the forbs that commonly occur. The few native grasses that remain in our area include purple needlegrass and blue wild rye. Appearing next in post fire plant succession are the woody shrubs whose seeds and/or lignotubers survived beneath the burned soils. We can expect to see manzanita, ceanothus, and blue oak seedlings, and perhaps sprouts from the few bushes that weren't completely incinerated. The buckeye may come back, along with some of the other oak species listed above. In the archetypal secondary succession schematic for these ecosystems, pines appear next on the landscape timeline. But a recent study conducted jointly by UC Davis and the US Forest Service surveyed more than a dozen burn sites in California and found that over 40% of pine tree forests did not successfully regenerate after a large, hot fire. Pine trees survive better after moderate, slow burning fires that kill the understory but do less damage to taller trees. In addition, high intensity burns can kill most trees in an area, so there may not be any left to drop seeds to start a new stand. Pines that do sprout have to compete with the shrubs that have developed post-fire survival strategies. What's different now? What's the overriding “external factor” in this case? It's the sheer intensity of this latest round of Northern California fires, and the attendant, albeit temporary, damage to the soils. Only time will tell which blend of survivors will return to create the green in the Camp Fire burn. Even when homeowners have created a defensible space, the job of protecting their home from fire is never done. There will always be ongoing and annual jobs to do. Additionally, there are special tasks that will need to be completed every few years or on an as needed basis. A key ongoing yard maintenance goal is to keep plants green and lush, especially within the 30 feet closest to the home (the “home ignition zone”). Of course this means regular watering, which can be time consuming, but employing a drip irrigation system on a timer largely eliminates that concern. 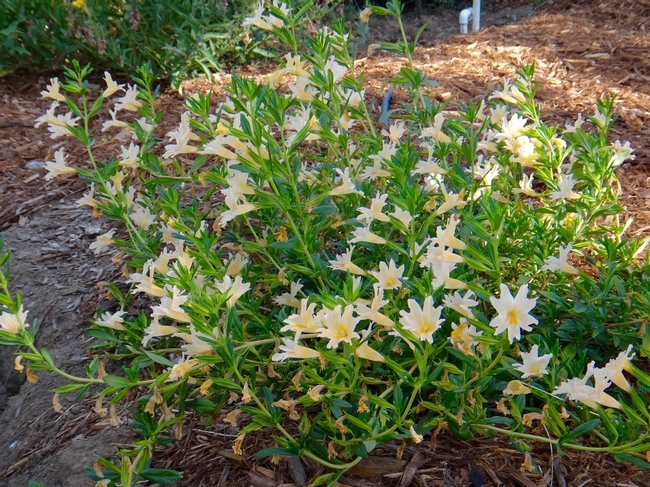 Using appropriate native plants should cut down on the overall need for watering as well. The ground in the inner 30 feet around a home should also be kept free of leaves, pine needles, weeds and other ground fuels. 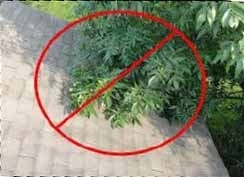 Dead plants and/or tree branches should be immediately removed, as should any tree branches overhanging the roof. Tree branches should also be kept at least 10 feet away from a chimney. Vines growing on trees, shrubs, or fences can act as fire ladders and should be removed. Roofs and gutters should be kept free of leaves, needles and twigs. Gutter covers can reduce, if not eliminate, fuel build-up in this area. If raised decks or porches are present, prevent combustible materials from accumulating in the areas beneath them. A preferable alternative to continually raking under decks and porches is to screen or enclose them with fire-resistant materials. If screening is used, the mesh should be no greater than one-quarter-inch. Flammable materials should be cleared from decks. This includes not only natural materials like leaves and needles, but items such as brooms and stacked wood. Annually, before fire season starts, grasses and weeds should be mowed to a height of about three to four inches for at least 30 feet around homes and other structures. Grasses and weeds should be maintained at this height throughout the fire season. 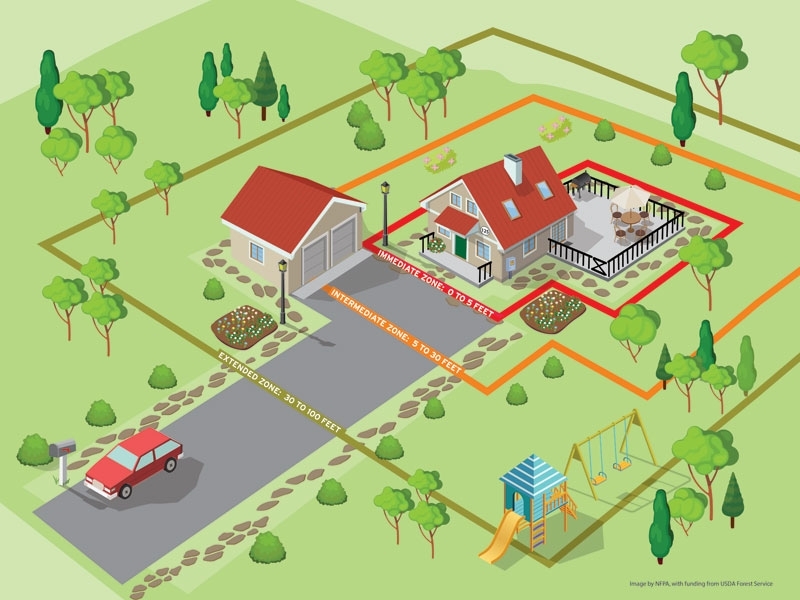 In fact, ground fuels should be kept at a minimum throughout the defensible space. As an alternative to mowing, string trimmers are a safer option for vegetation removal. To reduce the risk of fire due to mowing, make sure your equipment is properly maintained, mow before 10 a.m. and never mow on a hot or windy day. 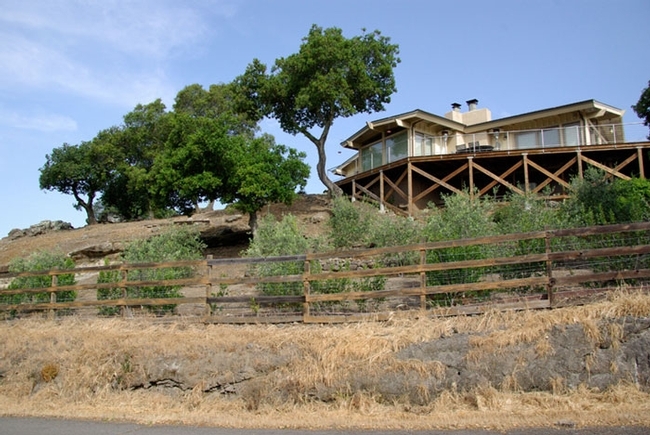 Vegetation throughout the defensible space should be pruned for proper spacing, both vertically and horizontally, at least once per year. 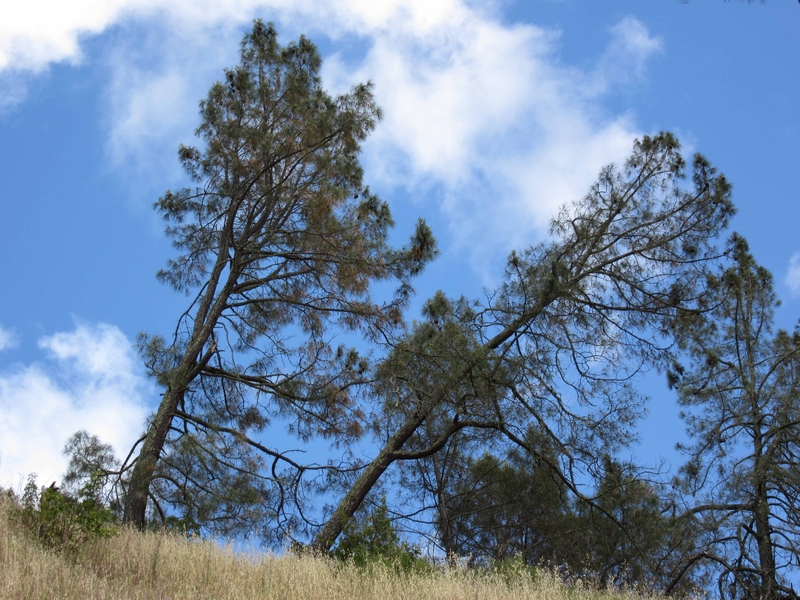 Cal Fire recommends that the lower branches of a mature tree be pruned to create a clearance of three times the height of the shrubs beneath it, while the distance between shrubs should be at least twice the height of the shrubs. In addition to maintaining proper spacing, pruning also makes plants more fire resistant. Cutting back woody perennials encourages less flammable new growth and thinning overgrown shrubs reduces their fuel load. Avoid topping landscape trees. Topping not only increases the fire hazard by encouraging excessive branching, but it is not healthy for trees. Woodpiles should be located at least 30 feet from a home and should have at least 10 feet of cleared space around them. Covering a woodpile, or storing wood in a fire-resistant structure such as a metal shed, lowers the odds of the pile igniting during a wildfire. In addition, miscellaneous combustible materials including construction debris and brush piles should be removed from your yard as quickly as possible. To aid firefighters, be sure your address is clearly posted so that it is easily visible from the street, especially at night. Also, be certain firefighters have easy access to water sources in your yard and, if possible, clearly mark those water sources. Fires often lead to power outages, so if you are on a well, it would be prudent to have an emergency generator to operate the pump if the power does fail. Cal Fire has developed a “Homeowners Checklist” that describes how to make your home fire safe. It is an excellent, easy-to-use, comprehensive guide for homeowners. It is highly recommended. 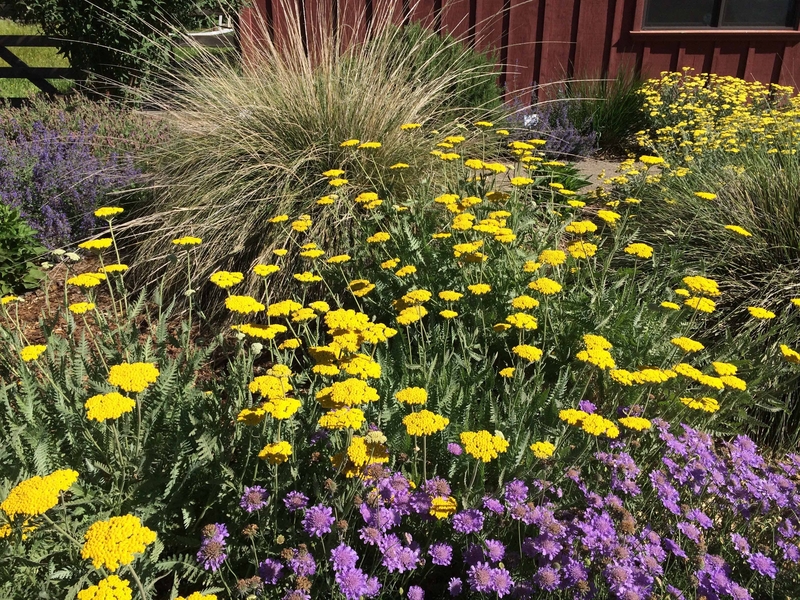 For more information on creating fire-resistant landscapes, see the Fire-Safe Landscape section of the UC Master Gardeners of Butte County website. Other helpful website resources include Yard Maintenance by UC Master Gardeners of Sonoma County and the Butte County Fire Safe Council. For other topics of interest to local gardeners please visit our home page. And if you have a gardening question or problem, call our Hotline at (530) 538-7201. In the wake of the devastating Camp Fire, thousands of Butte County residents are facing the daunting task of rebuilding their homes and landscaping their yards from scratch. They may be reevaluating their landscapes and wondering if there are more fire resistant plants that can be substituted for those that burned. Thousands of others, especially foothill residents whose property was spared, may be taking another look at their landscape plants as well. The good news is that some plants are more fire-resistant than others, but it must be emphasized that fire-resistant plants are not fireproof! It is important to realize that creating a “firewise” landscape entails much more than choosing the right plants. Although plant type is important, it is secondary to creating a defensible space, which will be the topic of a forthcoming article. Still, a working knowledge of fire resistant plants is a good starting point for creating a firewise landscape. Fire resistant plants are relatively slow to ignite and tend to have certain characteristics in common. They have moist, supple leaves and their watery sap usually lacks a strong odor. Fire resistant plants also tend not to accumulate dry, dead material within or beneath the plant. Plants that are slow growing will accumulate fuel at a slower pace, so they require less maintenance. 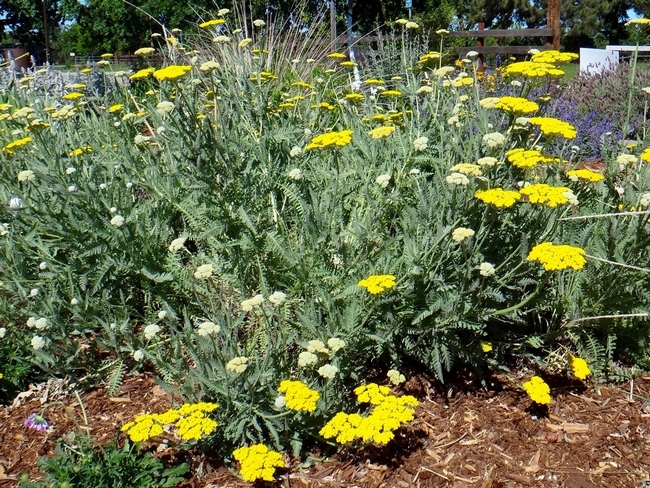 Native species can play a role in firewise landscaping as well. Drought tolerant native plants often maintain a high internal water content without needing much water and native trees commonly have a high tolerance for fire. Native trees may also restrict the growth of more volatile invasive species. Examples of fire resistant ground covers include ajuga, creeping thyme, creeping phlox, wild strawberry, snow-in-summer, sedums, hen & chicks and California fuchsia. Some fire resistant flowering plants are yarrow, allium, columbine, coreopsis, delphinium, gaillardia, daylily, iris, lavender, Echinacea, lupine, poppies, penstemon, salvias (which are exceptions to the aromatic sap guideline), lamb's ear, evening primrose, hosta, coral bells, dusty miller, and bulbs of all kinds. Shrubs that are fire resistant include ceanothus, butterfly bush, spirea, rose of Sharon, Oregon grape, lilac, mock orange, potentilla, forsythia, cotoneaster, island bush poppy, currants, camellia, azalea, monkey flower and viburnum. Aloe and other succulents are generally considered fire-resistant, but avoid succulents such as ice plant that produce mats of flammable dry material. Choose deciduous trees such as maples, oaks, sweet gum (liquidambar), locust, redbud, dogwood, ash, toyon, and smoke tree. Citrus and deciduous fruit trees such as cherry, peach and plum are fire resistant. Although most conifers are highly flammable, redwoods are the exception to the rule and are a desirable tree in a firewise landscape. Highly flammable plants often have an excess of fine, dry or dead material and contain volatile waxes, terpenes, or oils. Their sap is gummy or resinous and aromatic. They may have loose, papery bark as well. Examples of flammable plants are sagebrush, conifers (cedar, pine, juniper, fir, Italian cypress), broom, rosemary, eucalyptus, palms, feather and fountain grasses and dry annual grasses. 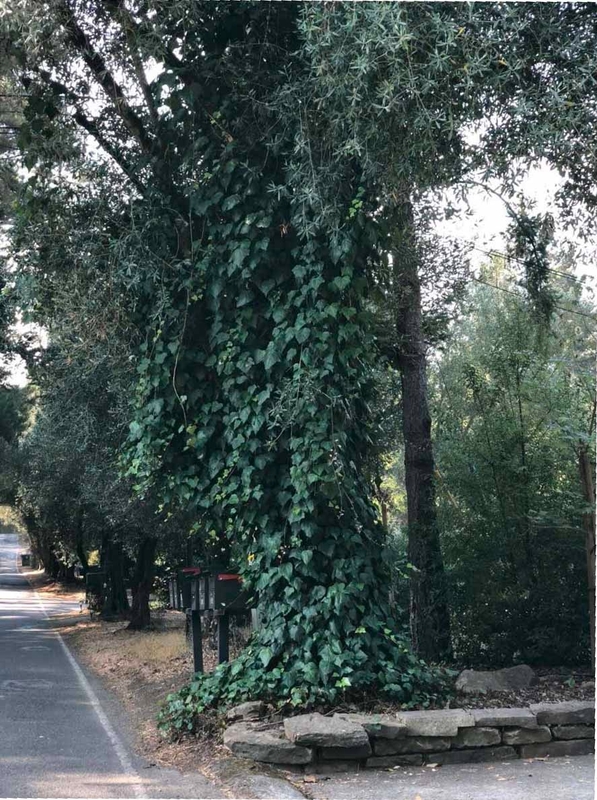 These plants should be avoided when planning a firewise landscape; if they already exist in a landscape, consideration should be given to removing them. For more information on creating fire resistant landscapes, see the Fire-Safe Landscape section of our website. 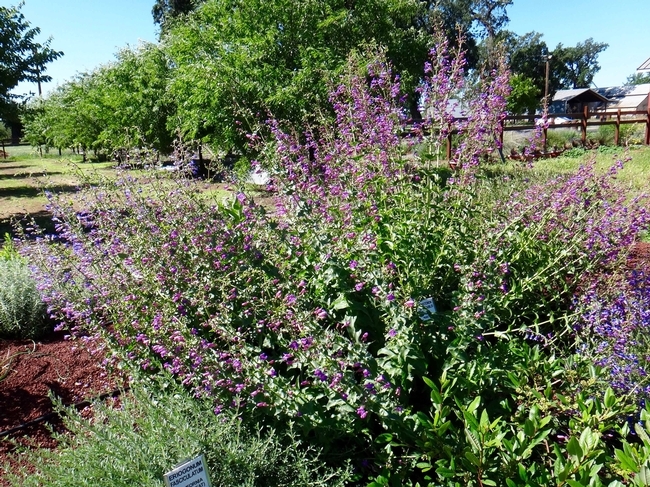 For other topics of interest to local gardeners please visit our home page at http://ucanr.edu/sites/bcmg/. And if you have a gardening question or problem, call our Hotline at (530) 538-7201.